at the British Museum, London, 22 April – 25 July, 2010. Andrea de Verrocchio, Head of a Woman, ca. 1475. How does one represent the world, in all its three dimensional plenitude, on a two dimensional surface? When Picasso split a woman’s face in several parts and showed us each segment from a different point of view, he was addressing this question. In the art of representation, this is a core problem, one that is always implicit in those artefacts that we call pictures. Italian artists of the early fifteenth century tackled this problem in such a way as to alter permanently Western concepts of pictorial art. If earlier artists, such as Giotto, had begun to explore the possibilities of creating a sense of volume on a flat surface, it was a Florentine architect and sculptor who famously formulated a system for that practice. In 1413, Filippo Brunelleschi painted two panels, both architectural views, now lost but described in detail by his biographer, Antonio Manetti. The panels served as a visual treatise, a pictorial invention. Arguably, the foundational status of Brunellesci’s device lies in the fact that it transcended the boundaries that kept science and art apart. That invention of Brunelleschi’s – known as artificial or linear perspective – established the rules for the proportional diminution of three-dimensional objects painted on a two-dimensional plane. Those rules both presupposed and defined the idea of a homogeneous, continuous, isotropic geometric space. Since Modernism, this system – which was considered to be the realisation of the structure of vision itself – has been deemed to have run its course. Yet perspective is everywhere with us. We are now so accustomed to the look of perspective in a drawing or painting, a graphic novel or an advertisement, that we hardly think of it as either a convention or an invention: perspective has been naturalised. Perspective suggests, in the first instance, a stable point of view, a fixed location from where a view is taken. (In this respect, pre-digital and pre-Photoshop photographs appropriated the conventions of perspective, for they too were the products of a single, unmoving point of view.) As a consequence of this immobility of the viewer, perspective also introduces the idea of a frame: a boundary delimiting the field of vision encapsulated by that particular vista, that singular ‘snapshot’. So perspective is intimately linked to the idea of a picture, defined as a bounded object, one that differs greatly from the expansive, scroll-like, horizontally linear narratives of frescoes painted directly on church or palace walls. These are story strips that require large spaces with ritualised functions, for they invite the viewer to follow them not only visually, but also physically: you walk and look, walk and look . . . or, bored with prayer, you turn your head this way and that, looking all around you. With the perspectival picture, the viewer is enlisted to a different kind of observation, a more private contemplation of a single, framed image. Even though most twentieth century art was furiously engaged with ways of breaking loose from post-Renaissance pictorial conventions, with the Renaissance picture was also born the idea of a kind of reverential, hushed spectatorship that is still with us: museum viewing as we know it. Historically, this kind of spectatorship is also increasingly linked to a sense of deference to the artist as an individualised maker and possibly even as a genius. In its ideal form, then, the Renaissance picture gives us a glimpse into a world that not only seems measurable, but that also places the human subject at its centre. My bodily scale provides the measure for the seen universe, for things (even imaginary things, like dragons) larger and smaller than myself as they find their positions upon a three-dimensional stage whose axes are determined by my sovereign gaze. It is as if my gaze, my fixed point of view, were the source of this image as it systematically unfurled away from me; as if, in looking at the picture, I were both looking through a window, and inventing the scene. This directional address to a subjective, individual gaze was matched by an increase in the naturalism of the figures depicted. 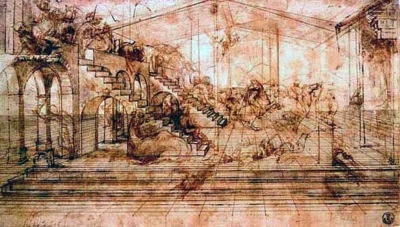 With the particularities of the spatial competence that perspectival drawing granted artists, came the need to place figures within that illusory space rather than frieze-like in front of it, just as actors might be positioned three-dimensionally within the space described by the proscenium stage. Gesture loses the hierarchical simplicity of earlier icons and becomes not only purposeful for the narrative but also expressive; faces and bodies are increasingly nuanced, inflected with humanity, with interiority. With this kind of naturalistic painting, the need to draw more accurately, paying great attention to plasticity and detail, became paramount. 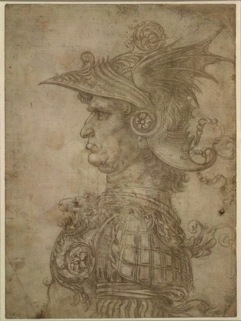 Drawing lay at the heart of Italian Renaissance picture making. ‘Draw, Antonio; draw Antonio, draw and don’t waste time,’ Michelangelo scrawled on a sketch he gave his pupil and assistant, Antonio Mini, in 1524. An exhibition at the British Museum in London gathers about a hundred Renaissance drawings, magnificently exhibited under the majestic dome of what used to be the Reading Room. For all their diversity, the works in the show make a cohesively breath-stopping display. 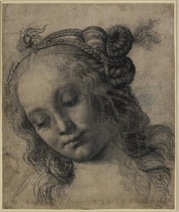 Bringing together rarely seen and extremely delicate works from the collections of the British Museum and the Uffizi Gallery in Florence (arguably the world’s two foremost collections of Renaissance drawings), the show is one of those once-in-a-generation, if not once-in-a-lifetime opportunities to see works that were not intended to be seen by the broader public. 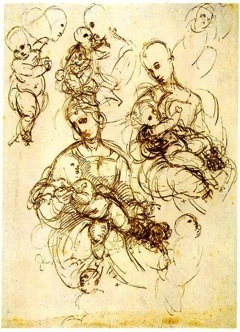 Affected by the diffusion of print-making from northern Europe, more formally elaborated ‘finished’ drawings have been exhibited from Renaissance times, but the idea of viewing a sketch as work of art is a fairly recent one, dating to the late nineteenth or early twentieth century. Prior to this, roughly worked drawings were regarded either as the private annotations of an artist – the artist’s thoughts given visual form – or as preparatory stages in the construction of a more finished work of art. Yet our contemporary sensibilities are primed for the contingent, the manifold, the experimental and the hesitant, and to our eyes, many of the drawings on show look like finished masterpieces in their own right. Pietro Perugino, Sibyl (preparatory sketch for God the Father with Prophets and Sibyls), ca. 1498. Most of the studies in the exhibition are directed towards the production of a painting. As a collection of works, the exhibition also reveals the extent to which drawings are a form of visual capital, establishing an archive of motifs (animals, body parts, drapery) that an artist might wish to use in other works. 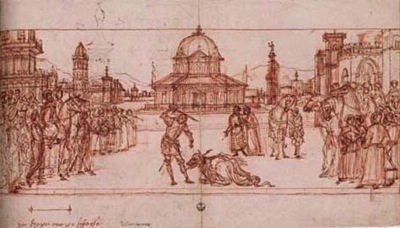 The exhibition tracks the major stages in the making of a Renaissance painting, from the loose sketches that initially explored details of anatomy, architecture and drapery; to gridded drawings used to plot the position of each constituent part of the projected work; finally to the life-size ‘cartoons’ that were employed as the blueprint for a finished composition. The contours defined in the cartoon would be laboriously pricked with a pin, enabling the artist to transfer the image precisely, using powdered chalk or pastel. The more minutely elaborated, completed compositional drawings could have the added purpose of demonstrating to the patron – the person funding the commission – what the finished, painted composition might look like. But alongside the various functions and techniques of drawing, we are also shown the diversity of drawing styles over time: the decorative cascade of folds in the drapery of Parri Spinelli’s St Peter Holding a Key (1435-45) compared to the far more volumetric drapery of Bartolommeo Montagna’s A Bearded Man with a Turban(1490-1500) or the sculptural, finely hatched drapes in Michelangelo’s An Old Man wearing a Hat (1495-1500). Further into the show, a geographical perspective – drawing styles as they evolved in the different Italian city states – expose other shared pictorial values, famously, the Florentine emphasis on line compared to the Venetian privileging of tone. In excellent wall texts and a substantial catalogue essay, the curators of the exhibition, Hugo Chapman and Marzia Faietti, underline the important and often neglected material factors that condition the way an artistic style or medium develop. Essential to the understanding of how and why drawing became so popular in the fifteenth century (and here I am not going to enter into the vexed question of causalities and tautologies, chickens and eggs) was the development of the techniques of paper making as a cheaper substitute for vellum. The increased popularity of paper-making served, a bit like Gutenberg’s press, to make drawing more economically viable and nurtured the expansion of drawing as a studio practice, where a century earlier it hadn’t existed at all. Compared to the burnished, completed quality of Renaissance paintings – the paintings for which many of these works were preparatory studies – the drawings here look so fresh and lively that it is almost as if, in the process of finishing a painting, some thought became not only crystallised, but also entombed. By comparison, a drawing is like a thought as it darts around trying to find form and expression: mercurial, experimental, alive. A drawing is a precious opportunity to catch an artist’s working process, to see procedure in its temporal unfolding. In Leonardo’s exceptional studies of the Christ child playing with a cat, we feel the inarticulate joy of the child as he embraces the animal, feel the animal’s impulse to squeeze and wriggle away. With uncanny resonance of Leonardo’s cat, we see the Christ child in Raphael’s Studies of the Virgin and Child (ca. 1506-7) trying to slide away from his mother’s embrace, as if wishing to escape his sacrificial destiny. At the same time, the agitated quill marks in both these drawings are the temporal record of the process of capture of the image, from eye to hand and back again. It is a rare opportunity to be with Leonardo, with Raphael, in the making of a work. Indeed, it is this very quality – a vivacity, a sense of the presence of the artist’s hand, that so animates this exceptional exhibition. It is as if we were taken back five centuries and shown the workings behind the scenes, made privy to the processes, the material and conceptual considerations, that constituted studio practice. Don’t miss this show – and if you do miss it, get the catalogue! 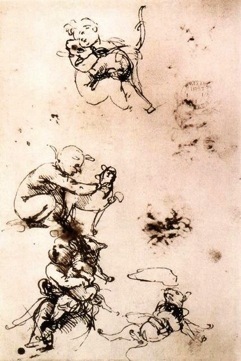 Leonardo Da Vinci, Study for the setting of The Adoration of the Magi, ca. 1481. Vittore Carpaccio, Triumph of St George, ca. 1501-8.